Why Hasn't Cher Worn Area Yet? Area's latest collection may have been their best yet (which is saying a lot, because every Area collection is a stunning Area collection). Designers Piotrek Panszczyk and Beckett Fogg innovated in a number of ways — new styles included prairie dresses, crinkled crop tops, dangling floral earrings, a gleaming burnt-orange trench coat, and flowing tunics that seemed to float off the body, held up by some miracle of gravity. But Panszczyk and Fogg also stayed true to classics, showing their trademark pink and turquoise high-gloss fabrics on short catsuits and glamorous, high-volume turbans. The designers make clothes fit for mythical, club-going mermaids; Cher, both in that film and in life, would surely be a fan. Sequins are an Area standard, and these season they were used to especially dazzling (pun intended) effect. They were dotted over net overlays shown on top of blazers, t-shirts, and bra tops alike, shown criss-crossed on the sides of lime-green pants, and sparkling stones were used in sunburst embellishments on sheer fabrics and crisp shirts. Area's gathered tube tops and dresses are a brand stalwart (NFYW queen Kim Petras wore one to the show), but this season they expanded the offerings, utilizing the style on new silhouettes. Our favorite take was in black, a top with a plunging neckline and peplum over flared pants with pleating at the knees. Panszczyk and Fogg said that they were inspired by Libuše Niklová, a Czech artist who invented inflatable toys in the 1960s. And the influence could be clearly spotted in the purses, an Area first. 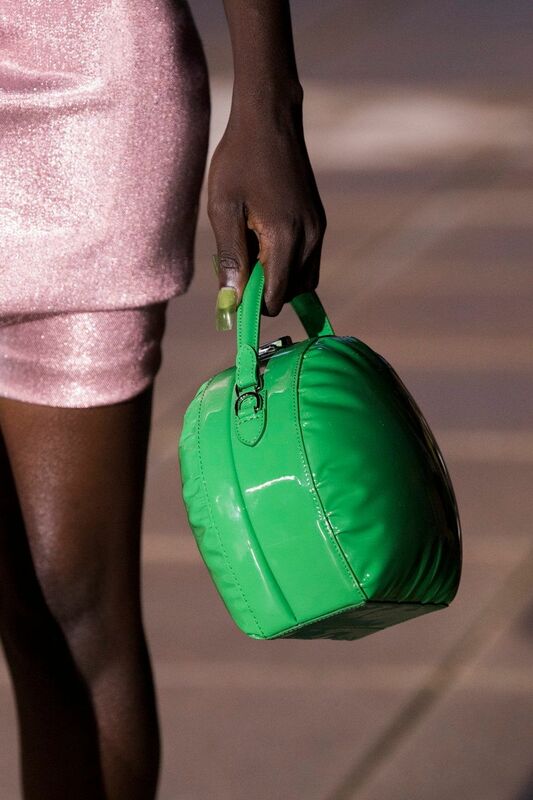 The label showed a number of adorable box-frame handbags, mini-trunks made in the same factory as Louis Vuitton's famed travel accessories, but they also featured balloon-like carryalls, round and squishy-looking. The show took place at regular Area venue New Design High School, an arts-focused school on the Lower East Side (students have been invited to help with the presentations). Panszczyk and Fogg have shown in all different areas of the school — an atrium at magic hour, a basement pool — but this season they took to the roof, adding enormous cloud-like sculptures as a backdrop. Guests included Petras, the Clermont Twins, and Christina Aguilera, who has been having quite the NYFW; she would later bring the house down with an ensemble of drag queens at the Opening Ceremony show. Photos by Mitchell Sams and Thomas McCarty, courtesy of Area. Additional image via Imaxtree.